Given how prevalent and normalized divorces are nowadays (even moreso than when I was a wee lad), a romantic comedy that treats the act with such casual seriousness seems positively quaint. Yet, The Awful Truth is anything but. It’s funny and charming, and just as sharp now as it must have been in 1937, mostly droll in its wit but not afraid of a pratfall when necessary. 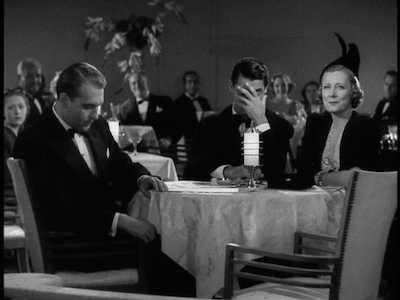 Written by Viña Delmar and directed by Leo McCarey, the team behind Make Way for Tomorrow [review], released that same year, The Awful Truth stars Cary Grant and Irene Dunne as Jerry and Lucy Warriner, a high society couple who have survived despite Jerry’s philandering. When Lucy decides to show Jerry that what’s good for the gander is good for the goose by orchestrating the perception of her own affair, the pair finally splits--only to discover they really do love one another once they see the other stepping out with someone else. First it’s Lucy getting cozy with Oklahoman millionaire Daniel (Ralph Bellamy, His Girl Friday [review]); then it’s Jerry making time with society girl Barbara (Molly Lamont). In the middle this whole time is Mr. Smith, a.k.a. Skippy, the fox terrier who is best known as Asta from the Thin Man series. A stand-in for the child they never had, Mr. Smith provides added comic relief while still keeping the lovers connected. The structure here is rather clever, and probably owes much to the natural breaks from the stageplay by Arthur Richman. There are four essential acts: the introduction and break-up, Lucy’s time with Daniel, Jerry’s time with Barbara, and the inevitable reunion. Act Three gets the broadest comedic strokes, as Lucy pretends to be Jerry’s sister in order to insinuate herself into a gathering and meet the competition. Dunne is brilliant playing the posh socialite pretending to be a coarse showgirl pretending to be a posh socialite. 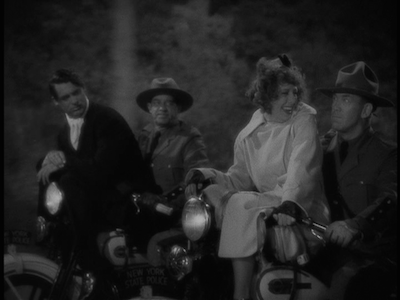 That said, the funniest physical business in the entire movie is Grant and Dunne riding on the handlebars of police motorcycles. It’s silly and yet wonderfully hilarious. Delmar is equally adept at writing slapstick as she is the emotionally resonant scenes that give The Awful Truth weight; at the same time, my loudest guffaws came from the dialogue. Delmar inserts a wicked line into the script on the regular--often as an otherwise inconsequential aside, like Dan declaring man’s best friend to be his mother or Aunt Patsy (Cecil Cunningham) noting two quarrelers who race by failed to “touch second” (funny in the moment, if sterile in a review). While modern writers would likely make the Warriners overly caustic or sarcastic, Delmar strikes the right balance. Like Nick and Nora Charles, they are terribly witty, altogether glamorous, and yet ultimately relatable. Of course, the performers have as much to do with this as anyone. 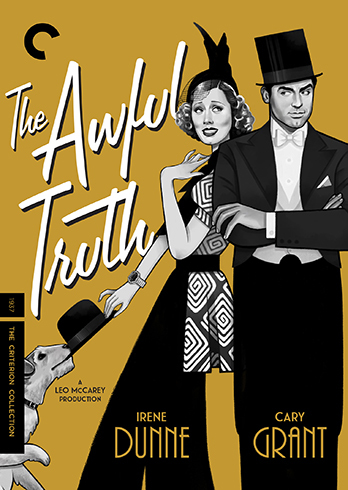 Particularly given Leo McCarey’s penchant for improvisation and working without a script; without the right actors, The Awful Truth could have simply been awful. 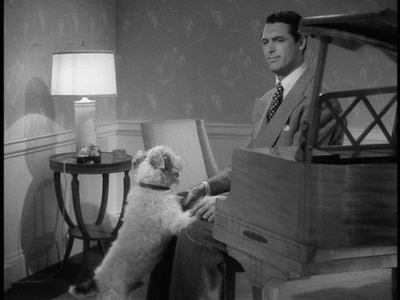 Cary Grant is at his comedic best, often hoisted on his own self-awareness, his knowledge that he’s smarter than the rest of the room never preventing him from being humiliated by his own hubris. 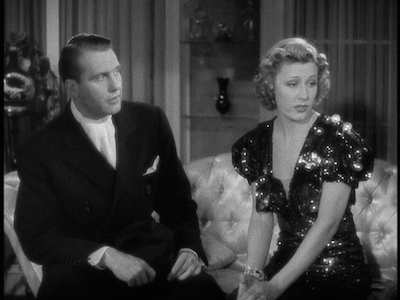 As his foil, the great Irene Dunne is lovably assured, usually a step or two ahead of Grant’s buffoonery, but never really mean. Both manage to be endearing despite themselves, and the audience’s genuine affection for them makes it easy to root for their amorous reconciliation. For his part, McCarey makes it look effortless. There is no punching up or punching down here, he approaches all characters equally, even if its Dan’s overbearing mother or the nigh tragic nightclub singer who doesn’t know how ridiculous her act is. 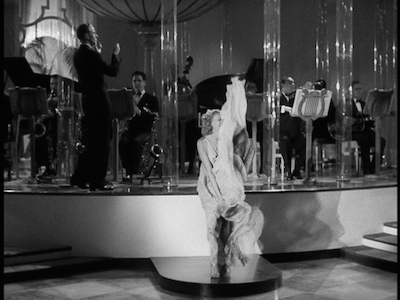 (Or how ahead of its time; the same shtick worked for Marilyn in The Seven Year Itch!) There is a kind heart at work behind the camera, which is most likely what also keeps The Awful Truth from descending into bitterness and cruelty, two of the most common human fail-safes in any divorce. Again, the soft peddle of the split is endearingly old fashioned, even as the reinforcement of the marriage pact is slight earnest, playing up the romantic comedy trope of two people who everyone knows should be together even when they don’t.